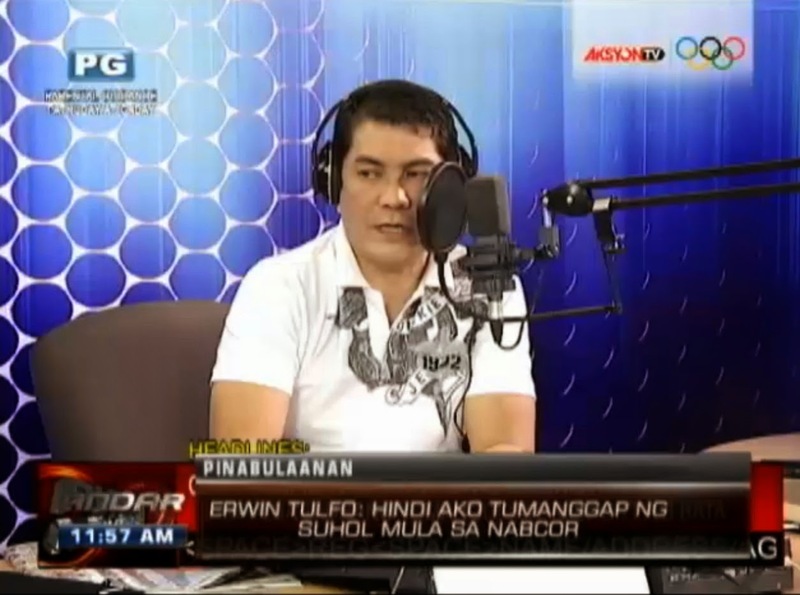 Erwin Tulfo has denied reports made by Philippine Daily Inquirer's Nancy Carvajal which claims that he received alleged payments for advertisement in 2009 from the National Agribusiness Corporation (Nabcor) — one of the agencies implicated in the pork barrel scam. In his column in The Manila Times published on Tuesday, Tulfo clarified: "I never had an ad about Nabcor or DA back then, thus, I’m not aware that a check is due me." TV5, his current employer, released a statement Wednesday, saying that it will "stand by the statement of Mr. Tulfo, but will conduct its own internal inquiry into the matter." The Inquirer on Wednesday reported that Tulfo, who was then working for Radio Mindanao Network, and DZBB's Melo del Prado, were "among the beneficiaries of the diversion of congressional allocations from the PDAF coursed through Nabcor." Meanwhile, GMA Network's radio operations group consultant Mike Enriquez said that the network will "conduct a thorough investigation on any allegation of any violations." "GMA Network places the utmost importance on the professional and ethical conduct of all its personnel, particularly those engaged in news and public affairs. Any information regarding activity that runs counter to our core values and ethical standards is taken very seriously," Enriquez said.